Fra Bartolomeo or Fra Bartolommeo (di Pagholo) (March 28, 1472 – October 6, 1517), also known as Baccio della Porta, was an Italian Renaissance painter of religious subjects. Joseph Bail [French, Realism; also known as Joseph-Claude Bail] was born January 22, 1862, during a period of intense disagreement in the late 19th-century French art world. Traditional styles were being challenged and interest in expressing nuances of daily life was becoming more and more rare. Not all artists, however, participated in expressing the newer styles. Hans Baldung. German Northern Renaissance painter, printmaker, bookmaker, graphic designer & stained glass artist. Born 1484 - died 1545 Also known as: Hans Baldung Grien, Hans Baldung Grun. Student of: Albrecht Dürer (1471-1528). Collaborated with: Hans Weiditz, I (1475-1516). Jacopo Bassano (Mannerism; also known as Jacopo da Ponte, c. 1515 - 13 February 1592) was an Italian painter who was born and died in Bassano del Grappa near Venice, which he adopted the name. Jules Bastien- Lepage born Nov. 18, 1848, Damvillers, France, died Dec. 10, 1884, Paris. French Realist (naturalist) painter of rustic outdoor genre scenes widely imitated in France and England. He was also a portraitist of note. Albert Bierstadt (Romanticism, Hudson River School; January 8, 1830 – February 18, 1902) was a German-American painter best known for his large landscapes of the American West. William-Adolphe Bouguereau (November 30, 1825 – August 19, 1905) was a French academic painter. Bouguereau (pronounced boo goh roe) was a staunch traditionalist whose realistic genre paintings and mythological themes were modern interpretations of Classical subjects with a heavy emphasis on the female human body. Alexander Pavlovich Brullov (Russian Neoclassical/Romantic Painter, Russian: Александр Павлович Брюллов, spelled Brulleau until 1822, when the family name was d according to Russian pronunciation, sometimes also spelled Brulloff; November 29, 1798 - January 9, 1877) was a Russian artist associated with the latest phase of the Russian Neoclassicism. Fyodor (Fidelio) Antonovich Bruni (Neoclassicism; Russian: Федор (Фиделио) Антонович Бруни) (June 10, 1799, Milan - August 30 (N.S. September 11), 1875, Petersburg) was a Russian painter of Italian descent. Alessandro di Mariano di Vanni Filipepi, better known as Sandro Botticelli or Il Botticello (Italian Renaissance; March 1, 1445 – May 17, 1510) was an Italian painter of the Florentine school during the Early Renaissance (Quattrocento). Ivan Yakovlevich Bilibin (Russian: Ива́н Я́ковлевич Били́бин; 16 August [O.S. 4 August] 1876 – 7 February 1942) was one of the most influential 20th-century illustrators and stage designers who took part in the Mir iskusstva and contributed to the Ballets Russes. Throughout his career, he was strongly inspired by Slavic folklore. Alexey Petrovich Bogolyubov (Russian: Алексей Петрович Боголюбов) (16 March 1824 – 3 February 1896) was a Russian landscape painter. The painter was greatly influenced by Ivan Ayvazovsky. His paintings lost all traces of Romanticism, replacing that element with staunch realism of the natural. After his death, Bogolyubov left all his money and capital (around 200 thousand Russian rubles (approximately US$6 million) to the museum and its painting school. Victor Elpidiforovich Borisov-Musatov (Russian: Виктор Эльпидифорович Борисов-Мусатов), (April 14 [O.S. April 2] 1870 - November 8 [O.S. 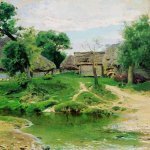 October 26] 1905) was a Russian painter, prominent for his unique Post-Impressionistic style that mixed symbolism, pure decorative style and realism. Together with Mikhail Vrubel he is often referred as the creator of Russian Symbolism style. John Brack (10 May 1920 - 11 February 1999 in South Melbourne, Victoria) was an Australian painter, and a member of the Antipodeans group. Giuliano Bugiardini (January 29, 1475 – February 17, 1577) was an Italian painter of the late-Renaissance period known as Mannerism, active mainly in Florence. Jacopo Bellini (c. 1400 – c. 1470) was an Italian painter. Jacopo was one of the founders of the Renaissance style of painting in Venice and northern Italy. George Price Boyce (1826–1897) was a British watercolour painter of landscapes and vernacular architecture in the Pre-Raphaelite style. He was a patron and friend of Dante Gabriel Rossetti. Sir Edward Coley Burne-Jones, 1st Baronet (28 August 1833 – 17 June 1898) was a British artist and designer closely associated with the later phase of the Pre-Raphaelite movement, who worked closely with William Morris on a wide range of decorative arts as a founding partner in Morris, Marshall, Faulkner, and Company.